Bit the bullet last weekend and ordered a new SQ5. Took it for a test drive a few weeks back. It drove nice, lacked a bit of power but to be expected I guess. Bolted a some nice extras and expecting it to be delivered sometime in February or sooner. Anyone else got one or waiting for theirs? Very nice, although ive alway had A/S4s I have a soft spot for the SQ5. On a new SQ5 ranged between 0 & 4% so wasn't enough to tempt me this time. I'm guessing there will be a black pack option soon. If you look on the used Audi site there's a few pictures to keep you going untill February! Discount wasn't anything to shout about, but I managed to haggle 4.5% off. Was there nothing that you could get a little earlier form pre configured / ordered dealer stock? I managed to find one that was 99% the build i would have done a couple of months ago rather than waiting the full 6 to ship from Mexico etc. It was already in Germany going through inspection. 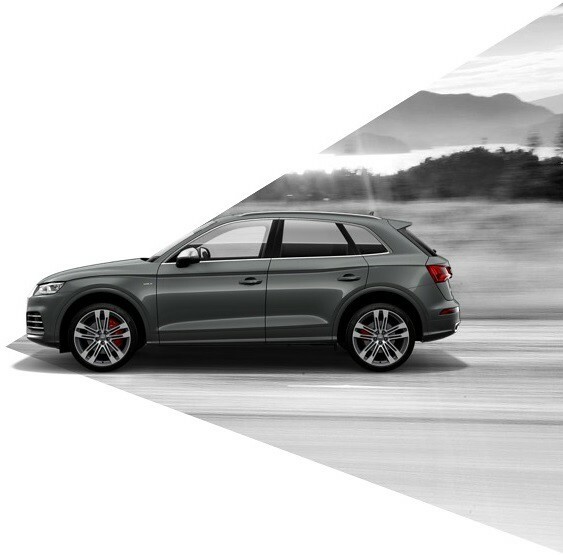 The Q5 platform is the best selling model for Audi, so they wont discount it much at all, sadly. Nothing available near our trim. We added some nice bits as we intend on keeping it for a while. Drove 110 miles and got 32mpg out of it, so not too bad. It rides really well in Auto mode - have yet to try other modes. Engine is silky smooth too with a nice V6 burble - haven't gone over 4K revs - and seems eager to rev and gave a little 'parp' once. It's really flipping quiet in the cabin. At 70 you can hear a pin drop. B&O system is the best I've ever heard - way better than the S3 B&O system - loads of bass range which is very impressive. Filled up from 1/4 tank showing and it took 50 litres of Shell V Power. Interior lighting in all the different colours is a fun touch that looks superb. All in all it's a very high quality vehicle - a huge step up from the S3, which is the biggest surprise. DeckedS3 and paul wev like this. Good feedback considering you've come from an S3, I have an 8P and a 8V. And I think the B&O in the 8V is so much better than the Bose in the 8P so if the B&O is even better in the SQ5, I'm a happy man! That is a really nice spec. I'm sure February can't come quick enough! No Air ride for me - I am happy with the standard adjustable dampers. Extended LED - this is really cool and the interior is lovely at night. There is a lot that comes as standard too like remote power tailgate, heated seats, privacy glass and pre sense - which bleeped at me the other day as a car in front had stopped quickly. Lots of clever tech. I am loving the ride in comparison to the S3 - smooth and relax and happy wafting along the road. its not TOO big for car parks either, whcih was a concern - only 15 cm wider than the S3 - but feels much bigger inside. MPG is up and down at the moment and i, annoyingly, cannot get the MMI to talk to the Audi server and activate Google Maps - but everything else works fine. B&O is still a revelation! 200 miles so far and still very pleased. Nice spec too. I was pleasantly surprised with the standard spec. I'm looking forward to the virtual cockpit, my sis has it on her TT and I love it. I love it - had it on the last S3. Cant get the Audi Connect to work - says server currently unavailable try later - so thats a trip to a dealer when I can be bothered. There is a quite noisy clunking at 25 mph when, i presume, the doors auto lock - need to get that looked at, its loud enough to mean somethings not right IMO - might be fuel cap cover. Other than that, and the fact i don't need to drive anywhere at the moment nor do i feel the need to give it WOT everywhere, it continues to exceed expectations. Drive home revealed a couple of things. Doors lock at 10 mph, so it's not that. The clunk you can feel too. With the power of google I have discovered that it's the abs pump doing some check / priming. It's something that affects A4, S4, Q5, SQ5 apparently and reduces as the car gets driven more. Bit of a play last night in dynamic and sport / manual mode. Dynamic simply removes body roll. Slow (ish) speed driving around town revealed that it handles REALLY rather well around corners or through chicane type road layouts. This is a new thing for me and very impressive. Seemed to handle as well as the S3... I will stress this was up to 40mph tho. I'm not expecting it to be the same as a low CoG hatchback, but it's not far off. Lots of pops, bangs and rumbles on downshifting to around 3k revs. Liking the new sq are ya? Still loving it - do 250 miles this weekend and my only 'gripe' is the mpg which averaged 31 mpg - probably about 10 less than the S3. They haven't given me a date yet. I suspect it'll be 4.5 months (fingers crossed). mxnrg and paul wev like this. 1. At 24 mph the ABS tests itself and you get two rapid, audible, 'clunks' you can also feel through the pedals - nothing to worry about. 2. Audi Connect was difficult to get working initially. You may need to deactivate the Data Module and then reactivate it to get Google Maps and the other Connect services working. Took me a while to figure this out. Pinky1959, Jsmills, Ian66 and 2 others like this. I think i had this issue with the S3. I thought it was me . Looks good in Nirvana! Enjoy. That looks like my car! Navarra is, in my humble opinion, the nicest Audi colour (having had the S3 in it previously...). I only have the 20" wheels though. Am thinking of getting some 21's and converting the 20's to winter wheels when the 21's start coming up on ebay. Pinky1959 and christuffley like this. Audi have confirmed my SQ5 is expected to begin construction on the 25th of December.... Apparently! Someone's going to have a bad Christmas. Will you toast your car build on Christmas Day ? Damn it has been sometime since we last spoke! you may not remember me from the days of the VW Golf R32 and the Brands Hatch meets back in 2006-2008 period, back then you had your FT360 Golf R32! help jog the memory, I am the one who had the cats! well the wife did. Username on the Golf R32 forum was 'Zirconium'. I have moved on to other cars since, including EVO X, M135i and now have settled with the S4. 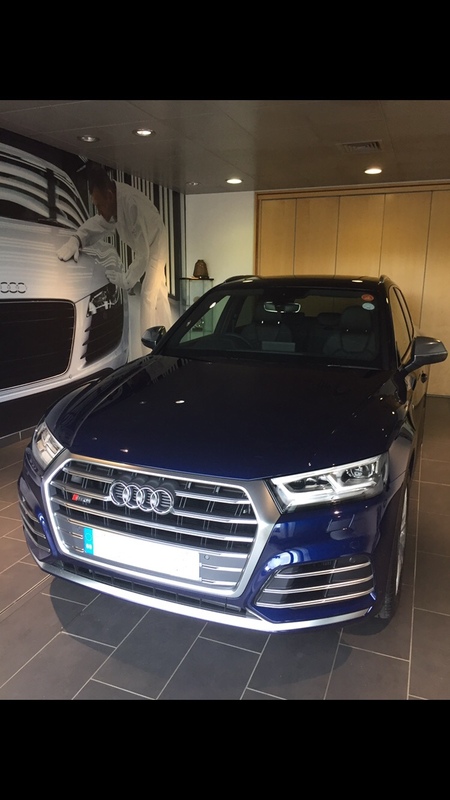 Congratulations on the new Audi SQ5, you will love the car and the engine is absolutely great. In march this year we took delivery of a new Audi S4 estate and I am in love with the car . Saying that, when I ordered the S4, I would have loved the SQ5 but it was not released and was told the new SQ5 would be diesel so I decided to go for the S4. We are looking at a Q5 at the moment but the 2.0 TFSI 252 bhp to replace the Audi A1 we use as a daily driver. Look forward to the pictures when it comes and hopefully I paths will cross at some point in the future during a meet! On order Audi s4 b9 and Audi a1 1.4 tfsi black edition. DeckedS3 and SPIKE_S3 like this. Username on the Golf R32 forum was 'Zirconium'. I remember my days well on the R32OC. Loved our mkV R32, and it was the longest we ever kept a car! I've still got the S3 I replaced the R32 with, its going to keep it for the long term as a weekend toy. Any progress on your SQ5, Assembly complete? It's now shipping... Much sooner than I was expecting. Anyone got any idea how long it takes to ship from Mexico? Agreed, I managed to get my local Audi dealer to match my best quote. You'll be waiting a long time for delivery though. Mines shipped but it's still not on it's way to the UK. They've got some delays, up to 12 weeks apparently. I’m in the middle of deciding what to do and what spec I want. Replacing the wife Q3 to go alongside my S4. Longer the delivery will suit me better as I’ll be sending the Q3 back early. That is a nice discount, around 12%. Beats what I got before Christmas from my dealer. Is that for a custom spec factory order, or a existing stock car? Any more word on expected delivery date? That was for whatever spec I wanted on the car ie factory order. I am being quoted about 4 months for delivery. If they had something similar sitting in stock I would consider it. 4 months for delivery sounds optimistic, unless your dealer assigns you an existing order slot that they can still modify.